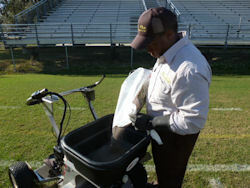 Technician Ryan Cannon of Live Oak Pest Control in Live Oak, Fla., pours Talstar XTRA granular insecticide featuring Verge technology into the hopper so he can treat Suwannee High School’s fire ant problem. PHILADELPHIA—For five high schools throughout the southern United States, there’s one less thing to worry about before playoffs: fire ants. That’s because each school won 10 bags of Talstar XTRA granular insecticide featuring Verge technology, a new product from FMC Professional Solutions that offers fast elimination of fire ant mounds as well as season-long protection. Talstar XTRA is labeled for a broad spectrum of surface-feeding pests, including fire ants, Caribbean crazy ants, billbugs, chinch bugs, earwigs, scorpions, fleas, and ticks. Its low application rates make it a cost-effective solution for both broadcast and perimeter pest control on turf. And now that it is formulated on Verge technology exclusive to FMC, Talstar XTRA is virtually dust and odor-free, and breaks down into the soil in minutes. The uniformly spherical granule flies off the spreader evenly, creating a more a uniform application and less pest breakthrough. For more on fire ant control in schools, or to order a free sample of Talstar XTRA, visit www.fireants101.com.